Yesterday, on Mon. 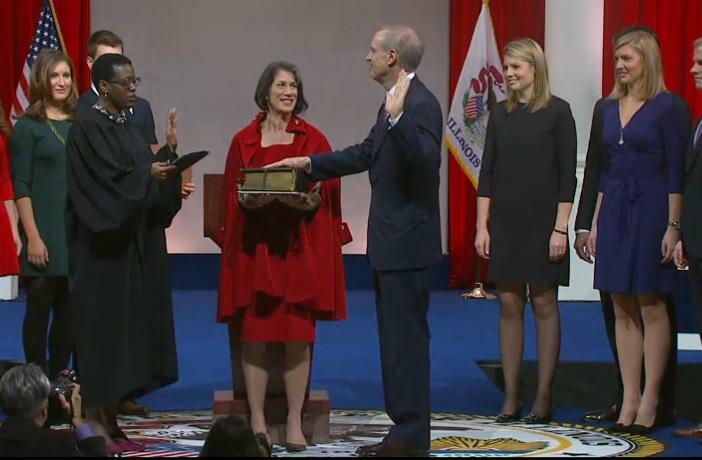 Jan. 12, 2015, Illinois got a new governor: Bruce Rauner -- the first Republican to win the governor's mansion in more than a decade.. The former private equity investor spent a record $26 million to win his first ever bid for elected office. And he didn't stop there. At the end of the year, Rauner contributed another $10 million that his spokespeople say he'll use to advance his agenda. Questions abound over what exactly that agenda is. He made a lot of campaign promises, but so far has painted his mission for Illinois in broad strokes. Whatever his aim, Rauner faces big obstacles. He takes over with a budget in deficit, a massive pension overhaul in limbo and a contract to negotiate with labor leaders still bristling from his attacks against them. Democrats also hold veto proof majorities in the legislature, giving them the power to block him from getting what he wants. All of that for a newcomer to state government. 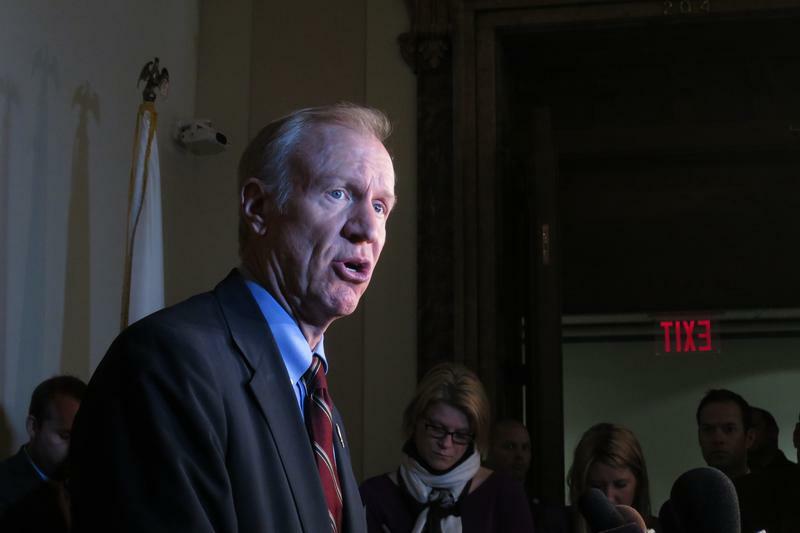 Amanda Vinicky asked capitol insiders what Rauner should do if he's to succeed. 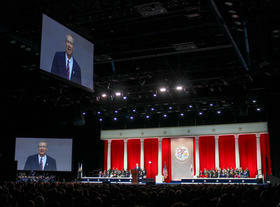 Inauguration day is time for pomp, lofty speeches and patriotic songs. But very soon, the time for celebrations will stop, and the difficult work of running a state will begin. If ever there was someone prepared for such a job (put partisanship aside here, I'm speaking strictly from a resume standpoint) Jim Edgar would make the list. When he became governor in 1991, he'd already "served as Sec. of State, I'd served as a state legislator, I'd been an aide to the governor, I'd been an aide to the speaker." And yet, he says, "there were a lot of things when I became governor, I just didn't know, wasn't prepared for." Edgar says Rauner is going to have a to learn a lot. And quick. Edgar, like Rauner, is a Republican, and even served on the new governor's transition team. But Edgar says Rauner will make mistakes, especially given his inexperience in government. Edgar says what's important is that Rauner learn from them. And that he prioritize. While an education and economic development plan are important, that can wait. "I've told him, I said, 'to me the most important things for you is to get a handle on the budget, and to put your staff together,'" Edgar said. While Rauner hasn't revealed his budget plans yet (or even revealed if he has a plan) he has begun filling out his administration. He's named top aides -- at least a half dozen, including his chief of staff are alums of GOP U.S. Sen. Mark Kirk's office; many helped run Rauner's campaign. And he's begun to announce key Cabinet positions. Who Rauner chooses is important, says Ron Gidwitz; Gidwitz is himself a wealthy businessman who failed in his bid for governor in 2006. Gidwitz was a key backer of Rauner early on this election cycle. "Nobody's going to do this all by themselves, it's all a question of picking the right people and delegating," Gidwitz said. "And that's what the governor's going to do. I'm very excited given the prospects of people he's already announced and the ones he will be announcing." Gidwitz didn't say who'll be part of that next round of appointments. I caught Gidwitz as he was leaving the inauguration ceremony to go to lunch with Greg Baise, the head of the Illinois Manufacturers' Association. Baise is a well-known lobbyist, and his association carries sway in Springfield. Perhaps more than ever now; the IMA was an early endorser of Rauner, and followed that up by giving $100,000 to Rauner's inaugural festivities. Here was Baises's recommendation for Rauner: "He's got to be able to provide clear vision; one of the problem's the state's had the past twelve years is not strong executive leadership. Legisltures can't lead. Governors can. And that's what we hope Bruce Rauner will do." Baise also served in former Governor Jim Thompson's cabinet. He understands Rauner will need legislators ... or more specifically, he needs a certain number of them. "Always remember, it's 30 and 60. You gotta get 30 in the Senate, and 60 in the House. You always remember that, you'll be well," Baise said. It’s the sort of advice a lot of lobbyists would probably give. On one level, it's the fundamentals of government. Getting a measure passed in the legislature is a key stop on the road of how a bill becomes a law. It can also be one of the most difficult, if it's a controversial bill -- like a tax hike, or cuts to services. Nearly every legislator I talked to (and believe me, I asked a lot of them) had similar advice on the best, way to get that done. -"I think the one thing that he can do is have an open door policy. Continue to meet with legislators and hear their concerns," Democratic Rep. John D'Amico of Chicago said. -"My advice to him is the same advice I'll tell you. And that is, that we are partners. The General Assembly is a partner in this process. And we have to work together," Sen. John Sullivan, a Rushville Democrat, said. -"Work with the General Assembly. This is going to be a necessarily bipartisan legislative session," said Sen. Don Harmon of Oak Park, who is also a Democrat. Rauner has won praise for reaching out to lamwakers on both sides of the aisle, but his repeated criticism of the General Assembly also left many legislators with bruises that won't quickly fade (not to mention the feathers he has already ruffled with labor leaders, their members and the state's workforce in general -- a story for another day). For all of the advice encouraging Rauner to be bipartisan, there's also advice along the lines offered by Republican Sen. Dale Righter, of Mattoon, who says that Rauner needs to remember his campaign premise that Illinois' finances are an "unmitigated disaster" that needs fixing. "Whatever he has to do, even when he is flying in the face of stiff opposition, he needs to stick to his guns on that," Righter said. "Because that's the message that people believe in. That's what the people want." Rauner was successful in private life at making a whole lot of money, and drumming up business for his private equity firm. The hope, and belief, that Rauner will do the same for Illinois is part of how he won in November against Democratic Gov. Pat Quinn, who didn't attend Rauner's swearing in. But the Better Government Association's Andy Shaw says Rauner must realize, public life is different than being CEO of a firm. "He'd better understand that government transparency is a lot different than business secrecy," Shaw said. "He comes out of the business world: that is a lot more secretive, a lot more private, a lot more confidential. He has to understand that government has to be much more transparent, much more open." To that end, here's one last piece of advice, from someone who has spent the better part of a decade following every twitch of Illinois government and politics: me. Bruce Rauner, you've said you don't care about winning re-election; that getting the state on track is your objective, no matter what it means for your politics future. My advice? Be open with the media about what you're up to. By being honest with the press, you're being honest with the people of Illinois. I realize you're looking at a huge budget hole, but that's my two cents.